XPO Logistics, Inc. has announced its financial results for the second quarter 2018. Revenue increased 16.0% year-over-year to $4.36bn. Adjusted earnings before interest, taxes, depreciation and amortization (EBITDA) increased to $436.7m for the second quarter 2018, excluding integration and rebranding costs of $7.8m. This compared with $370.8m of adjusted EBITDA for the same period in 2017. The company’s transportation segment generated revenue of $2.89bn for the quarter, a 14.5% increase from the same period in 2017. Segment revenue growth was led by increases in freight brokerage and last mile in North America, as well as dedicated truckload transportation in the UK and France. A revenue benefit of 2.2% came from favourable foreign exchange rates. Adjusted EBITDA for the segment improved to $335.1m, an increase of 13.7% from a year ago. The company’s logistics segment generated revenue of $1.51bn for the quarter, a 19.1% increase from the same period in 2017. Segment revenue growth was led by growing demand for e-commerce logistics globally, as well as by the consumer-packaged goods and technology sectors in North America and the fashion sector in Europe. A revenue benefit of 4.7% came from favourable foreign exchange rates. Adjusted EBITDA for the segment improved to $134.0m, an increase of 20.6% from a year ago. For the six months ended June 30, 2018, the company reported total revenue of $8.56bn, a 17.2% increase from the same period in 2017. Adjusted EBITDA for the first six months of 2018 improved to $766.9m, compared with $660.8m for the same period in 2017. Adjusted EBITDA for the first six months of 2018 excludes $15.0m of integration and rebranding costs. The company reaffirmed its full year 2018 target for adjusted EBITDA of at least $1.6bn. 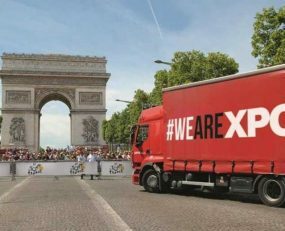 XPO Logistics has announced that John Hardig will step down as Chief Financial Officer on August 15, 2018. He will remain available to the company in an advisory capacity through September 15, 2018. Sarah Glickman, Senior Vice President, Corporate Finance, will assume the role of Acting Chief Financial Officer.